Referencing the sculptures found in the first Emperor of China’s mausoleum. 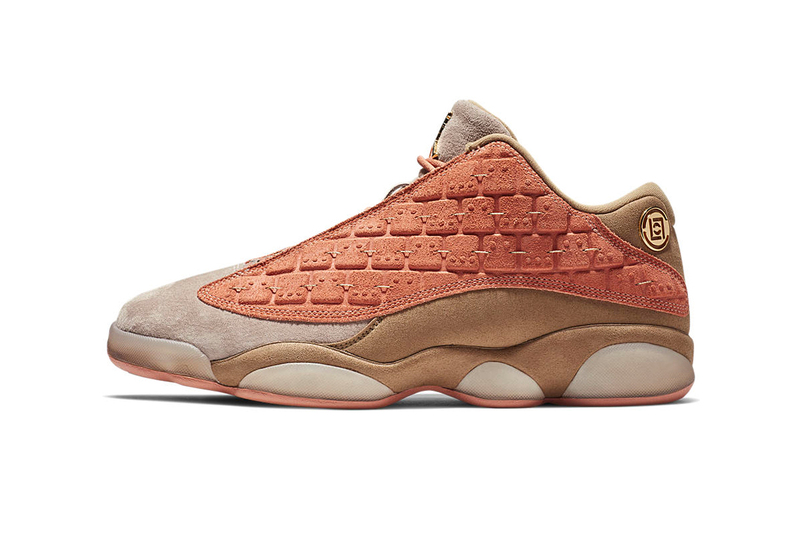 Following up from the initial look, we now have official imagery of CLOT‘s Chinese Terracotta Warrior-inspired Air Jordan 13 Low. Serving as the latest footwear collaboration from the label, the AJ 13 Low “Terracotta” features an upper that’s constructed of salmon, brown and grey colored premium suede; embossed and stitched to replicate the rectangular plates found on the lamellar armor of the famed Terracotta Army. Metallic-gold CLOT and Jumpman logos are applied on the tongue and heel areas of the shoe to add to the royal feel. Finally, the tones found on the upper are continued on the elevating sole unit, and are accented by translucent midsole segments along with a CLOT bubble at the carbon fiber shank. Priced at $200 USD, the CLOT x Air Jordan 13 Low “Terracotta” is set to pre-launch December 8 at Innersect and officially release at JUICE locations December 13. In case you missed it, the SoleFly x Air Jordan 1 “Art Basel Miami” recently received an official release date. Celebrating the 40th anniversary of Independent.